This was my father, also Willie Geddes. 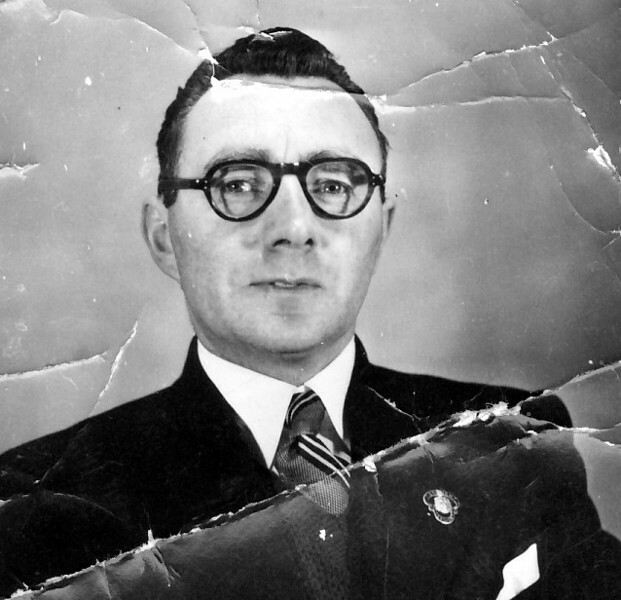 He was a Town Councillor for several years and this photo was an "official" shot taken for the first election he stood in the early 1950s. The photographer was J. W. Ross who has been mentioned elsewhere on this site. He wrote on the back of this photo: " Wm. Geddes. Grocery Manager of Joss Street. A candidate for Invergordon Town Council. He is Chairman of Invergordon British Legion,Treasurer of Invergordon Football Club and Welfare officer for the Army Cadet Force." Bill, this is a really good photo of your Dad. I don't think there are any Invergordonians who will not remember this lovely cheery man. He always had a good word to say whenever I met him. Jeanette is now a granny several times over and lives near Perth. Audrey is near Wellington in NZ. Visited her a few years ago and she has been back here once. Hi Bill, great picture of your Dad. I had the privilege of nursing him in the County Hospital. He was always so cheerful and accepting of his lot. I think your Mam and him knew my Mam and Dad when I was very young. My Mam died when I was five, but I have vague memory of visiting them at Munro street (I think). Thanks for looking after my Dad! It's good to be able to say that even though it was over 30 years ago! I was born in Munro Street and I think we moved from there to Joss Street about 1946. I still feel sad about my Dad's end, for such an active and humane person to suffer what he did is almost obscene and most certainly not deserved. So much for "you reap what you sow". Hope you are well. Regards, Bill G.
Bill, it is so sad that your Dad suffered so much. He was always such a lovely man with a smile and a chat for everyone. Margaret, were you in my class at school and is your Dad an electrician? Or am I totally wrong? Hi Rosalie, yes you are right, my Dad had the electric shop in the High Street. I think the shop was previously Jamiesons but don't remember what they sold - maybe sweets and tobacco. My brother Gordon carried on the business after my Dad retired but now runs it from his house as he has given up the shop. I believe a florist rents the shop now. I remember you Rosalie and Amelia - I have met her from time to time in Invergordon - also your sister Jeanette. I now live in Caithness since a couple of years, and have just recently found this site. I really enjoy looking at all the photos and comments and get so carried away I loose all track of time. Margaret, like you I was thrilled to bits when one of my daughters found this site for me. I too lose all track of time when I am "browsing". I hope you and your family are all well.